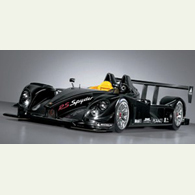 (autoinsidernews) Porsche unveiled its RS Spyder sports car for the 2007 racing season at the Paris Motor Show. Starting next year, customer teams will be able to take delivery of Porsche's LMP2 sports car, which until now been raced exclusively by Team Penske in the American Le Mans Series. The Penske Spyders have been the class of the LMP2 field and they just locked up the ALMS LMP2 team and manufacturer's championships finish 1st and 2nd in the LMP2 class at Petit Le Mans, reports Trend. The new RS Spyder for 2007 features an updated and upgraded chassis, modified suspension, improved aerodynamics, an easier-to-maintain body, and improved cooling. With its air restrictors, the 2007 RS Spyder's 3.4L V8 delivers 23 more horsepower up to 503 bhp at 10,300 rpm than the 2006 models.